Place the first 5 ingredients into a large pot and bring them to the boil. Then reduce the heat to a gentle simmer for 10 minutes and turn off the heat. Chop all the fruit into any shape you wish and add them all to the pot. Add the walnuts, raisins and hibiscus flowers. Allow the punch to cool and refrigerate until chilled. Ladle chilled punch into serving glasses. Add a splash of soda water and some rum or tequila, to taste (if you are using alcohol). Very carefully cut the fresh sugar cane into sticks. Garnish the serving glasses with fresh sugar cane sticks and fresh mint leaves. Notes: Ponche is traditionally made by cooking the syrup along with all the fruit for a much longer period of time and then served warm. 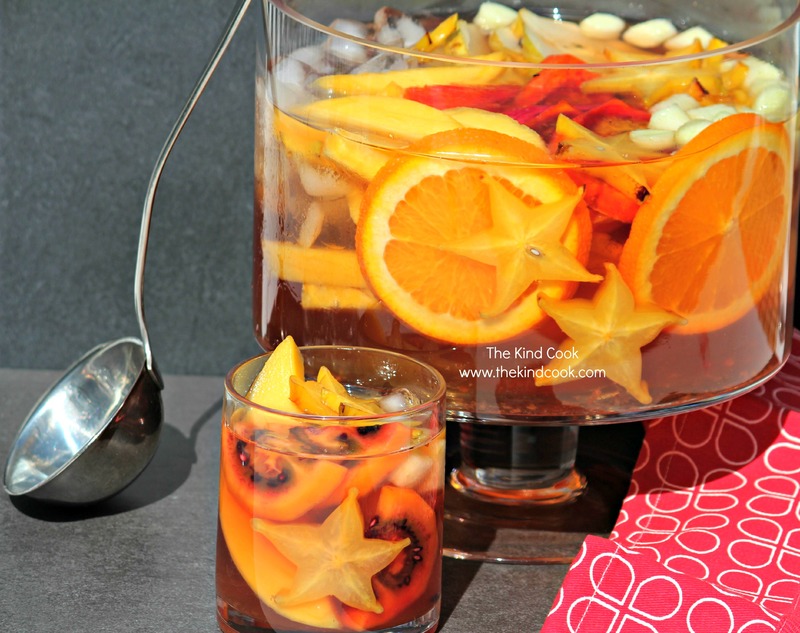 This recipe has been created to suit hot summers day with chilled punch and firmer fruits. If you don’t have agave you can use pure maple syrup. You can purchase prickly pear from specialty fruit and vegetable stores. Otherwise simply substitute for another tropical fruit. You can purchase hibiscus flowers in syrup at liquor shops and specialty supermarkets. If you cannot find it, simply omit it from the recipe. You can purchase fresh sugar cane from Asian fruit and vegetable grocers.